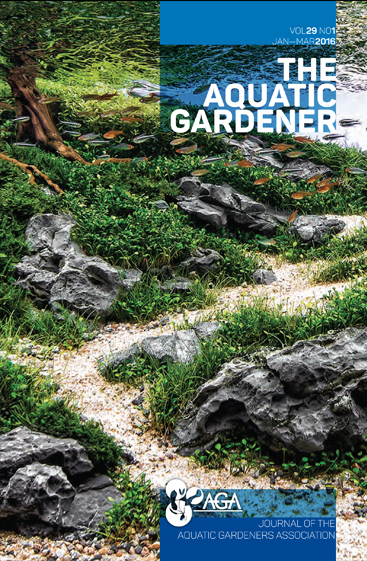 Members of the Aquatic Gardeners Association receive this magazine free four times per year. This is an actual paper magazine mailed to your postal address. Our 44-page publication contains a mix of articles from all over the globe, appealing to different levels of expertise, with beautiful full-color photos and illustrations. To obtain the journal, please visit our membership page. In-print back issues are also available for sale. Online Archive NEW! Members get full access to most back issues now! These businesses help to keep The Aquatic Gardener going--please support them! Contact us at adverts at aquatic-gardeners.org for advertising information. Any other republication or duplication of the original articles or graphics must first receive permission from TAG's editor or the article author. Artwork, photographs and articles are welcome from any source and may be submitted to the editor for consideration. We request first publication rights for articles accepted. Please contact Cheryl Rogers at editor @ aquatic-gardeners.org for submission guidelines.